Thanks, as an algal bloom owner, this vero will be a next project for me ! Merry Christmas all you guys! Mark- you can tag this one verified. its a quick and easy build that sounds good. i didn't try the switching mod yet, but i'm sure i will. 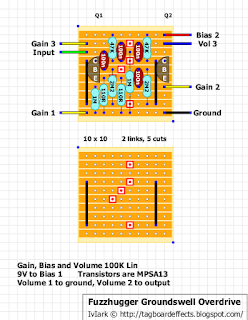 one thing, the transistor symbol should be reversed for the mpsa13's. no big deal. Merry Christmas guys, and thanks for all of your hard work! I've got MPSA18, will they work? I imagine any Darlingtons will work, yes? I guess so.. Just mind the pinout. I built this yesterday and really love it, excellent range of overdrive tones. My one negative about it is that at some settings im getting high pitched oscillation, has anyone else experienced this? i went back and played around with this again, and i also get the high pitched oscillation. it only occurs when the bias control is fully CCW. i didn't notice before because i hadn't used it on that setting. i put my meter across that pot, and it appears that as you rotate the bias CCW it starves voltage. maybe this causes the squeal? i don't know. its above my pay grade. i just build em'. maybe mark or miro could explain it or offer a fix. Cheers, glad it wasnt just my build then, aside from that i really like this circuit, its the best simple od i've made, beats the crap out of the devi ever karaoke party. Recently built this.. a 33k resistor on the middle lug of the bias pot then back to bias 2 on the board fixed the oscillation! Could you put up a link to the schematic for this one? 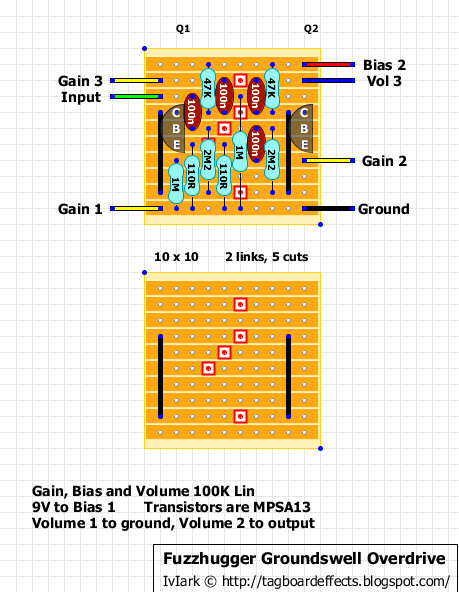 I think I only built 12-15 of these, 4ish years ago, after getting a request for a simple transistor overdrive. Super simple but not a bad little drive! You could try it with a handful of other transistors. So I built a pair of these today with the intention of cascading one into the other and having a toggle switch include the second circuit. I tied together the grounds from the each circuit's volume 1 and sent it to the input jack ground. I also tied together the bias 1 knobs to the 9v, with 9v going to Circuit 1 bias 1 and jumped to circuit 2 bias 1, although writing this out leads me to believe that wasn't the best idea. To get the switch I simply used an on/on toggle with the first circuit input on 2 which ran into the foot-switch in and the second circuit input on 3 with 1 being left open. Currently I am getting no sound even when bypassed. This was a complete cob job and I went a little mad scientist with it (I know nothing about why this stuff works but I can follow schematics very well). This was my first attempt at winging it. I figure it is a grounding issue, but it is very possible that i f'd up elsewhere. Give me some guidance guys! Have you grounded the output jack? Okay I got it working. What i did was complete re-wire with the dual effect offboard wiring guide from here. I put two circuits, two foot switches but but only used one bias knob. I think I will eventually remove the footswitch for the second unit and use a toggle instead but this works for now. Also I was only able to use MPSA13's on the first circuit so it sounds as it should but I threw some 2n4401's in the second because it is all that i had. The second circuit doesn't have enough bullocks on its own however it sounds pretty good with the first one running through it. What would I need to do to the circuit in order to put in a different set of transistors, say 2sd2206? On the Fuzzhugger Groundswell clipping switch what does top to tail mean? I'm assuming that's in series. Is it 1 + - + - 4 or 1 - + - + 4? very noisy! what to do? I am confused and possibly missing something that may be obvious to you experienced folk. Not sure as far as the 9v and bias pot are wired. I am just getting one loud splatty tone that I can turn up and down with all of the pots. Does bias 3 get wired anywhere? Does 9v+ get wired directly to the board? Please help clear this up for me! Thanks! Turns out putting in the correct transistors helps..ha. Tried MPSA18's cuz thats all I had. Sounded terrible. 13's got it sounding right.